So, what’s new? First, more tiles on the screen. This is how my main screen looked before. 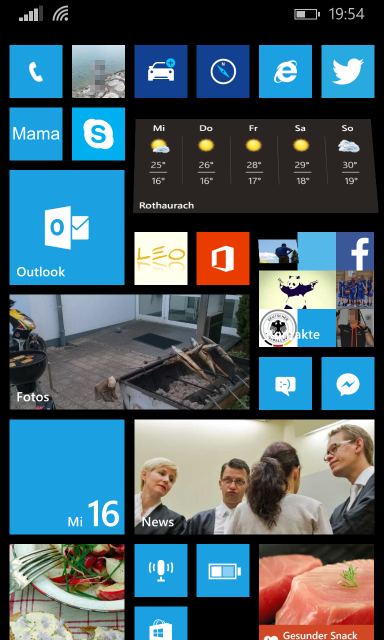 The additional third row of tiles is only enabled by default on devices that have a 1080p screen. 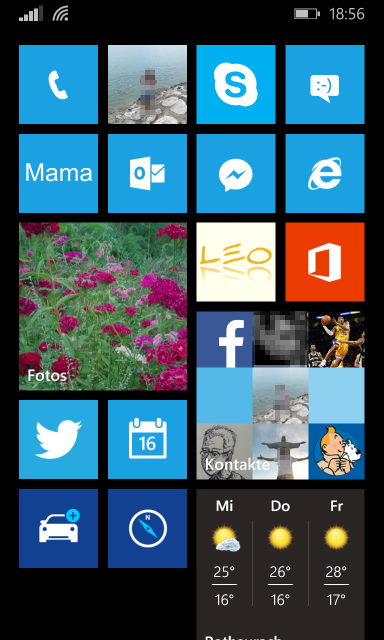 If yours doesn’t, like my Lumia 925, you have to enable the new layout explicitly in Settings -> Start Screen + Designs (or how it’s called in English). After doing that my main screen looked like this. Does that remind you of something? It looks like choosing a higher resolution on one of those old CRT monitors where you get more screen real estate on the Windows desktop. If you’re clumsy or have big hands, then it might be hard to hit the small tiles. In that case it would make more sense to stick to the previous layout. When using three rows the medium tiles use more space than the small tiles when only using two rows. I like the “higher resolution” and use the additional space to add a few more apps (that came bundled with the update) and also increased the size of some of the already pinned app’s tiles. What else has changed? Well, there’s a notification center. Unlike on iOS you don’t have to pull it all the way down. It can be locked at around 33% height, which is enough to access the shortcuts (which can be configured) to disable WLAN or enable airplane mode. As you can see on the screenshot, pulling down the notification center now shows you the battery percentage. This is a very welcome addition. I also think that the duration of the animation to get from apps to the main screen was reduced. It feels faster and thus makes the OS feel snappier. 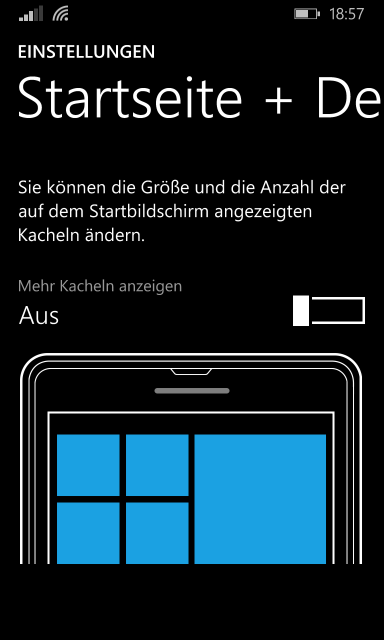 That feature is not yet available in Germany, only in the US for now. I have read that you could enable it by basically switching all of your phone to US (keyboard, language, whathaveyou) and then the Cortana tile appears. Since I don’t really care (for now) about those features – I never used Siri productively – I won’t bother doing that. When it comes out I’ll probably play around with it and then ignore it like Siri before. 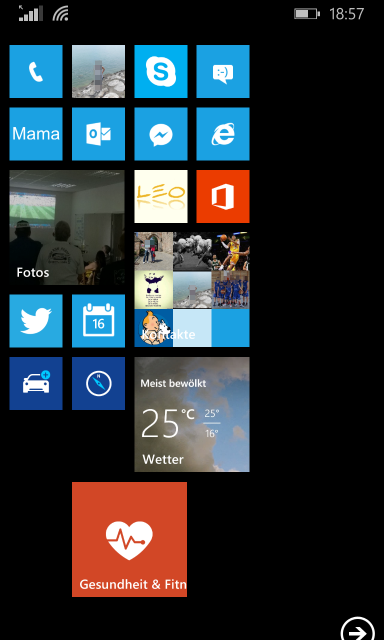 Apps are the major thing that Windows Phone always takes flak for. I don’t know the real numbers and I don’t really care as they also include the tons (not a spelling error) of thousands of cr’apps (I’m feeling lucky today). I’m not a big app guy but one thing I definitely need is something to listen to podcasts to. The OS now comes with a podcast app and I have immediately thrown all of my subscriptions at it. Although it is quite nice (better than Apple’s early attempts at an iOS podcast app) I’m missing some features to really make it work for me, like playlists. Adding all my podcasts and have it download only the most recent ones wasn’t the nicest of experiences. After subscribing, all the episodes are basically new. That means I had to mark all as read first (luckily there’s an option to mark all at once) and then find the most recent episode. Since the list is in ascending order I had to scroll all the way to the bottom to get to where I wanted. Depending on the number of items in the feed (I’m looking at you The Incomparable) you may have to scroll a lot. With this podcast app also came some Bing related apps like News and Food & Drink, both of which I have pinned to my main screen. I also use Health & Fitness which not only contains workouts but also some tips regarding nutrition. This kind of replaces iMuscle 2 which I have on my iPad, the only thing I have not yet found for Windows (it has a much larger library of exercises and animations on how to do them correctly). I may not use it as often anymore as I have when I first bought the app, but it really helped me get going and do more effective workouts. Now it serves as a sort of library of how I can train certain muscles with the tools I have at home. Most (or even all) of the apps I just mentioned have been available before, but the update installed them on my phone (maybe again, after I removed them the first time) which I noticed and actually liked. In a nutshell: most of what Microsoft itself offers in apps covers my needs. Apart from new apps, app loading speed hasn’t really changed, the camera also still takes a rather long time to start or resume. That’s one thing Nokia touts on its website about the Cyan firmware, so I’ll have to see how it performs taking pictures. Microsoft moved the settings for background apps out of the Settings menu and into an app dedicated to battery power, I think it is called Battery Sense. It makes sense (no pun intended) to put it there, but I had to do an internet search to find out. The previous location was more obvious to me. 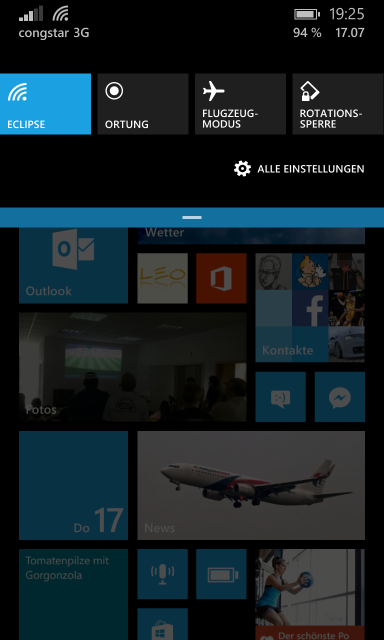 Windows Phone 8.1 comes with IE 11 and with it syncing of favorites. Finally! So far, it seems to be noticeably faster and I’m yet to experience any problems. I have also tried the word flow keyboard and I’m starting to like it. I just need to get away from the habit of typing and move to swiping. No matter how far off I am it usually guesses the correct word. There are a few things it constantly gets wrong, e.g the difference between “nich” (short form of “nicht”) and “noch” but so far I am very impressed. This is a feature of the kind “until I had it I didn’t know that I’d need it”.